For a luxurious country getaway, consider Blackberry Farms. Located in the foothills of the Smoky Mountains, the resort offers 69 accommodations, which include 34 cottages, 22 estate rooms and 2 three bedroom houses. It is an escape from urban living, capturing the essence of a luxury country lifestyle. I stayed in the Aracauna, named after a breed of chicken. Each of the custom built cottages offer stunning architectural features. The Aracuana, which is part of the Singing Brooke Cottage suites, offers peace, comfort and tranquility with awood burning fireplace, cozy interior, a signature king-sized feather bed and a huge bathroom. Attendants are available 24/7 for personal attention-including starting the fireplace. Private golf carts are provided for ease of transportation. There is a fully stocked pantry and complimentary in-room dining. Guests who don’t want to leave the luxury cabin have plenty of options for breakfast, lunch, mid-day snack or dinner. The resort offers gourmet farm to table dining for every meal and at every location. The property boasts of expert onsite artisans including a master gardener, baker, cheese maker, a forger, a butcher and a sommelierwho createspectacular indigenous foods. It is a culinary haven offering an amalgamation of garden herbs, and vegetables, uniquely blended and crafted to perfection. 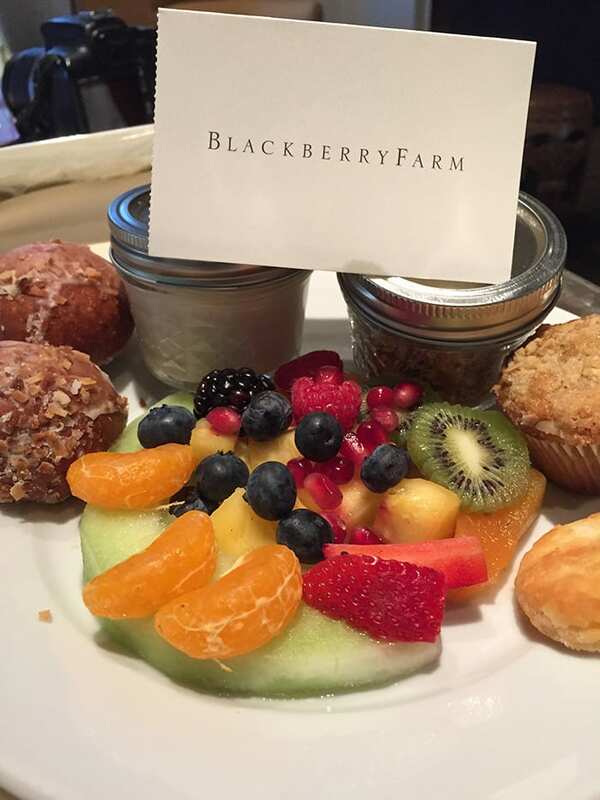 If you find yourself too comfortable to leave the cozy cabin, ordera farm fresh continental breakfast with blackberries, raspberries, and cantaloupealong with a grain and nut granola, yogurt and pastries. For some morning indulgence, go for the griddle cake of the day. All entrees are freshly prepared, complete with accompaniments as small jelly jars, honey and butter. Lunch recommendations are the Pimento cheeseburger on a sourdough bun with Tennessee Chow Chow and hand cut fries. For a lighter option, enjoy a garden fresh salad of field greens with Apple Cider vinaigrette. For in-house dining for dinner, consider the roasted poussin with vegetables. The chicken is flavorful and the fresh vegetables make it a satisfying dinner. In addition to in-house dining, there are designated lunch and dinner cabins. It is recommended to have lunch at the Main House, a cozy stone cottage and dinner atThe Barn, the dining lodge where guests are pandered. Assiduous servers pay attention to every detail, pampering each guest and tentative to all requests. The Barn is a large cozy cabin with wood beams above and a giant stone fireplace. Upon entering the lodge, visitors will be captivated by the open kitchen where chefs treat every plate as a culinary masterpiece. I delighted in a three course meal which was perfectly timed and proportioned. I began with the Garden Kale salad with fried hazelnuts, Benne Seeds and Apple Vinaigrette. It was flavorful and crunchy with the nuts and seeds and perfectly balanced with the vinaigrette. The second course consisted of a roasted Carolina shrimp with Anson Mills grits, Andouille, preserved tomatoes and pickled pepper emulsion. The rich creamy blend offers a harmony of spice with a finetexture from grits. The third round was The Painted Hills beef hanger steak, a choice cut, and flavorful. The steak is cut into bite size medallions. Each biteis flavorful, tender and juicy. The entrée is served with Buttermilk potato puree, miniature roasted carrots, onions and Forest mushrooms. Dessert at the lodge cannot be turned down. Highly recommended is Georgia olive oil ice cream which is served as mini rollsThe ice cream has a very light creamy texture and the olive oil gives it a slight fruit flavor with a hint of vanilla. The Wellhouse is where the spa and fitness activities are located. The split level spaprovides visitors with an array of options. The lower level consists of the steamroom, locker room and gift shop with fine skin and healthcare products, yoga attire and more. The upper level is where the massage rooms are located, along with the meditation and tranquility rooms. The meditation room is heavenly with a white interior, plush sofa lounge chairs and amazing views. It is the first site at the top of the stairs. The tranquility room is a fitness room in the morning and then converts into a relaxation room in the afternoon. Single wooden retractable beds lower from the ceiling offering a stunning and dramaticvisual. Guests are provided with plush blankets and can gently sway side to side on the suspended beds. Each bed is retracted into the wooden beam ceiling for the morning wellness classes. While there are many choices for spa treatments, recommended is the Healing Herbs and Flowers. The experience is customized based on the desire for the end goal; detox, relaxation or renewal. All ingredients are from an organic garden with flowers such as calandula and herbs such as sage and mint. The combination of massage oil, herbs and heat therapy sooth every muscle. There are many wellness programs and activities to educate on and promote healthy living. The latest program offered by the Wellhouse is Forest Bathing, which to note, is not literal bathing. It was named the 2105 Spa and Wellness Trend by Spa Finder. Activity and meditation in the forest is scientifically proven to enhance benefits and provides four times the benefit compared to indoor workouts. The base of the Smoky Mountains provides diverse phytochemicals emitted in theforest, which make it conducive for Forest bathing. Choose from low to high intensity including a high endurance yoga hike. “Blackberry Farms approach to spa and wellness is rooted in a philosophy of balance. Our goal is to help you relax and renew, while also nurturing sustainable habits for healthy lifestyle after your stay is over,” states Anderson. If you are looking for a sanctuary for personal discovery, vitality and relaxation, consider Blackberry Farms.Every guest can expect a multidimensional renewal with well trained experts onsite to meet every need. Visit http://www.blackberryfarm.com/ for complete information on customized retreat.